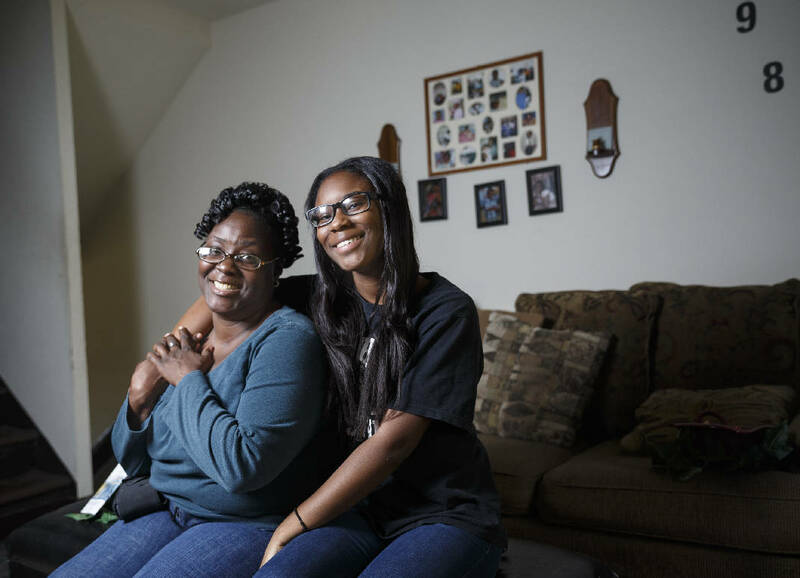 LaTonya Porter-Yost, left, and her daughter Chanel Mobley sit in the living room of their home for a portrait Wednesday, Nov. 25, 2015, in Chattanooga, Tenn. Porter-Yost, the sole provider for her family, received help from United Way after she was diagnosed with a life-threatening heart condition which forced her to leave work. Shortness of breath. Light headedness. Dry cough. Constant tiredness. A heartbeat so rapid you could see her shirt pulsating. LaTonya Porter-Yost, 42, knew something wasn't right around this time last year when she started experiencing those symptoms. N'Co, her 9-year-old son, said his mother started closing her eyes and holding her chest a lot, even when just sitting on the couch. 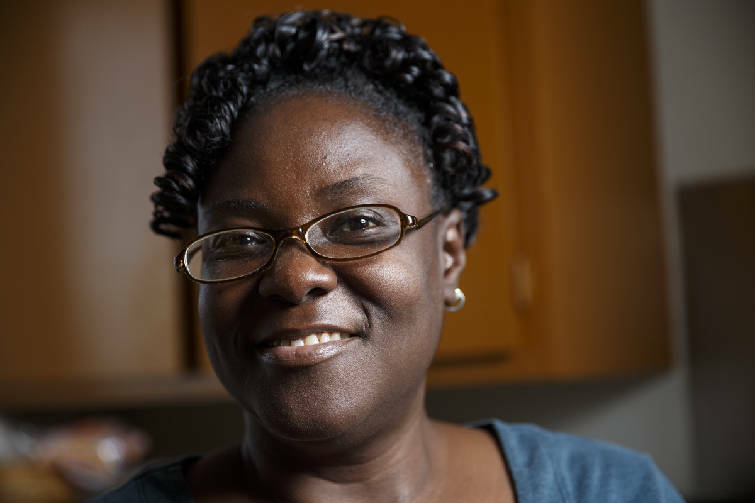 LaTonya Porter-Yost stands in the kitchen of her home for a portrait Wednesday, Nov. 25, 2015, in Chattanooga, Tenn. Porter-Yost, the sole provider for her family, received help from United Way after she was diagnosed with a life-threatening heart condition which forced her to leave work. Eventually, she went to the doctor and got the diagnosis: active congestive heart failure and cardiomyopathy. Porter-Yost quit her job as an attendant at a nursing home because she has to continuously monitor her heart rate. Now she goes back and forth to Vanderbilt for treatment. "It's almost as if my whole body has been separated from my mind," Porter-Yost said. "Because my mind is wanting to do what I used to do. And my body is telling me, 'No, you can't do this anymore.' So it's like being without all of me." This year, Porter-Yost was selected for United Way's Neediest Cases campaign. The fund began in 1914 at the Chattanooga Times. It continued when the Times merged with the Chattanooga News-Free Press in 1999 and became the Chattanooga Times Free Press. Last year, readers donated $47,098 to the campaign, which helped 300 families. United Way takes the money donated to the Times Free Press and gives it to those who don't necessarily qualify for other types of financial aid. Any local nonprofit 501(c)(3) can apply on behalf of their clients to Neediest Cases by calling United Way's 211 number. Each person is then assessed on a case-by-case basis. "The idea is to serve people who need a hand up and often have exhausted other means of aid or simply do not qualify," said Alison Gerber, Times Free Press editor-in-chief. "Sometimes, even a modest amount of money can help someone at a time of crisis or need. We hope the Neediest Cases Fund helps recipients navigate a difficult time in their life." Porter-Yost received $500 from the campaign. Half went to rent for her apartment and half went to gas cards for her trips to Vanderbilt and back. She also received a turkey so her family could have a proper Thanksgiving dinner. She always has to have her wearable defibrillator on, which is connected to a vest that monitors her heart. When something goes wrong — for instance, if she over exerts herself — it shocks her. It's especially needed when she sleeps — she said a lot of people with her condition die in their sleep. A heart transplant could be on the way for her, but if the eight different kinds of medicines she takes continue to work, that procedure could be put on hold. 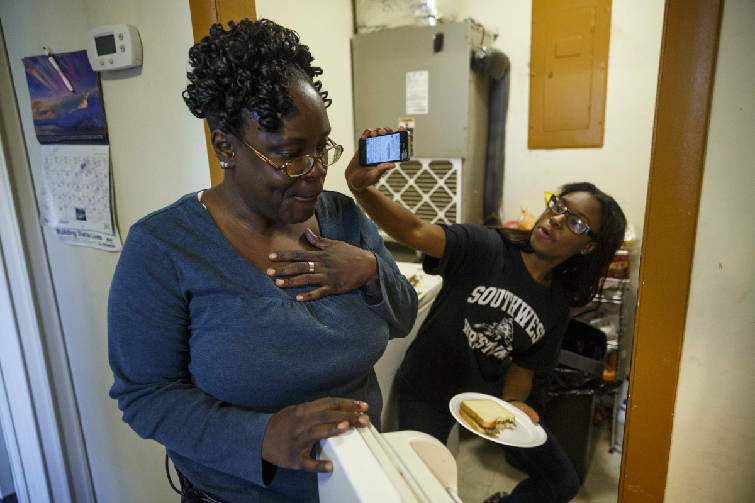 LaTonya Porter-Yost, left, jokes with her daughter Chanel Mobley in the kitchen of their home Wednesday, Nov. 25, 2015, in Chattanooga, Tenn. Porter-Yost, the sole provider for her family, received help from United Way after she was diagnosed with a life-threatening heart condition which forced her to leave work. She's kept her children in the loop the entire time. They know what she's going through, and they've picked up the slack. N'Co and Chanel, her 15-year old daughter, do more chores around the house. But more than that, they work to keep their mother's spirits high. They can't let her fall into depressive tendencies because she can't work. She calls them her "warriors." "We've been through a lot," Chanel said. "I just know how my mom is, and she's going to be strong. You just got to be strong with her. If we're down, she's going to be down." N'Co and Chanel have bright visions for the future. Chanel will be in college, she said, studying biomedical engineering with a minor in music. N'Co will be in high school, and he said he'll hopefully get a job. Most of all, they just want their mother to be OK.
"When mommy comes home, we'll have a talk or play or game or something," N'Co said. "Just spend time together. And the next day, do the same thing." Contact staff writer Evan Hoopfer at ehoopfer@timesfreepress.com or @EvanHoopfer on Twitter or 423-757-6731.